Shahrukh Khan , Nawazuddin Siddiqui and Mahira Khan starrer Raees has taken a bumper opening on its first day at box office. 2.) This is 3rd highest opening day in Shahrukh Khan's career after Happy New Year and Chennai Express and ahead of Dilwale. 3) Opening day of Raees is much lower than Salman Khan's Sultan and Aamir Khan's Dangal but that is mostly due to the clash. 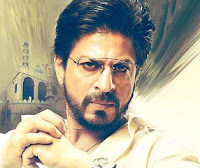 Advance Booking sales of Raees was bumper and by Thursday evening ticket sales of Rs 12.5 Crores had already been done for the weekend. Raess is expected to do better in overseas than Kaabil due to Shahrukh Khan's global appeal. Raees is estimated to be releasing on around 3400 screens which is lesser due to the clash but is much higher than Hrithik's Kaabil.